← What if I started a church . . . Does “theos” save? Is “theos” with us? These may seem like an odd questions. I was actually pondering these very questions one morning as I took my shower getting ready for church after attending shabbat the day before based on a book I had read recently. 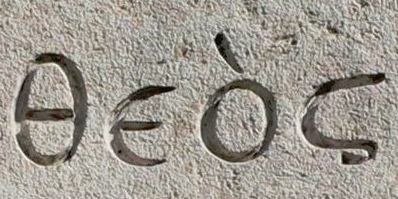 For those of you that don’t know, θεός or theos is the Greek word for God or deity. It was applied to Zeus. It was applied to other gods as well. Some of your are thinking right now, what’s the big deal? God saves. Says so in Job 22:29. This is actually שַׁע‎ yāshaʿ (yaw-shah’) which is translated as “He saves.” The Septuagint, which is the translation of the Hebrew text into Greek, does not use theos here. What about theos being with us? ‘Immanu El [God is with us]. If God’s personal name had not been revealed to this point, why the question? Why then the extra questions as well, (What is his name? What am I to tell them?)? “Say this to the people of Isra’el: ‘Yud-Heh-Vav-Heh [Adonai], the God of your fathers, the God of Avraham, the God of Yitz’chak and the God of Ya‘akov, has sent me to you.’ This is my name forever; this is how I am to be remembered generation after generation. He said, “Ehyeh has sent me to you.” Then He elaborated by getting very specific: Yud-Heh-Vav-Heh. This is the personal name of God and He commands us to remember His name – this way – generation after generation. No grey area here. He is LORD. He is Creator. He makes the rules. Not us. There can be little argument here. For the life of me, I am not sure what that argument would be if there was one or how it could be made or how it would even be relevant. Psalm 149:3-4 (CJB) 3 Let them praise his name with dancing, make melody to him with tambourine and lyre; 4 for Adonai takes delight in his people, he crowns the humble with salvation. Thoralf Gilbrant, ed., “8428,” in The Complete Biblical Library Hebrew-English Dictionary – Sin-Taw, (Springfield, IL: World Library Press, Inc., 1998), WORDsearch CROSS e-book, Under: “8428”. Exodus 6:3 (CJB) 3 I appeared to Avraham, Yitz’chak and Ya‘akov as El Shaddai, although I did not make myself known to them by my name, Yud-Heh-Vav-Heh [Adonai]. Exodus 34:14 (CJB) 14 because you are not to bow down to any other god; since Adonai — whose very name is Jealous — is a jealous God. Leviticus 20:3 (CJB) 3 I too will set myself against him and cut him off from his people, because he has sacrificed his child to Molekh, defiling my sanctuary and profaning my holy name. Are you starting to get the picture here? I don’t see a need to go further into the text about names being important – specifically, the name of God, because the text is quite clear unless you don’t want to see what it says? This leads us to the last part – Jesus. Dr. Michael L Brown has written a fascinating book that I have enjoyed very much entitled What do Jewish people think about Jesus? In chapter 38, he tackles the sacred names movement theories accurately and thoroughly concerning Zeus and YAHshua. I don’t have a Ph.D. In Semitic languages like Dr. Brown. I don’t have to. I have interlinears and commentaries by some pretty smart people in their own right. There are many with PhDs in Semitic languages that are on different bible translation teams for various versions – why don’t they all come up with the same exact translations? Because it is a translation. Translations have bias: theological, financial, scholarship etc. The point is, translation strategies are based upon a number of factors seen and unseen. Marcion had one. The Roman Catholic church had one. Martin Luther had one. The list goes on . . .
“In short, “Jesus is as much related to Zeus as Moses is to Mice.” Unfortunately, some popular teachers continue to espouse the Jesus-Zeus connection, and many believers follow the pseudo-scholarship in these fringe, “new revelation” teachings. Not only are these teachings and practices filled with error, but they do not profit in the least. So to every English-speaking believer I say: Do not be ashamed to use the name JESUS! That is the proper way to say His name in English – just a Michael is the correct English way to say the Hebrew name mi-kha-el and Moses is the correct English way to say the Hebrew name mo-sheh. Pray in Jesus’ name, worship in Jesus’ name and witness in Jesus’name. And for those that want to relate to our Messiah’s Jewishness, then refer to Him by His original name, Yeshua – not Yahshua and not Yahushua – remembering that the power of the name is not in its pronunciation but in the Person to whom it refers, our Lord and Redeemer and King. Obviously, I do dispute some of what he has stated in this paragraph. Not the Zeus. Not the Michael or the Moshe. Not the Yahshua. No, what I object to is the contradiction – implied and otherwise. Let’s start with this (and I don’t mean this disrespectful in any way). Let’s sit in synagogue singing and reading from the prayer books, and let’s call HaShem (the Name) theos every time elōhîm is mentioned. Technically, from a language standpoint, they are the same thing – they mean god. But as I am sure Dr. Brown will admit, they are NOT the same thing because context is not the only thing that matters. Adonai is a substitution for Y-H-V-H out of respect – out of fear – out of reverence. This is also the basic Hebraic definition of “awe.” There is not awe in theos. Fouad 266 challenged an area that was also pretty much without dispute in scholarly circles because [LXX] (the Greek translation of the Hebrew scriptures) from around the 4th century had kurios and theos substituted everywhere Y-H-V-H would have been. Fouad 266 is earlier (1st to 2nd century) and has the Tetragrammaton (Y-H-V-H) in Aramaic square nestled among the Greek text. This phenomenon was also observed at Qumran as well. Matthew 1:18-25 (CJB) 18 Here is how the birth of Yeshua the Messiah took place. When his mother Miryam was engaged to Yosef, before they were married, she was found to be pregnant from the Ruach HaKodesh. “Yosef, son of David, do not be afraid to take Miryam home with you as your wife; for what has been conceived in her is from the Ruach HaKodesh. and he named him Yeshua. He will save the people from their sins is the purpose. Why did God tell Yosef what name to give the yet-to-be-born child if it didn’t matter? Why did Yosef obey this command if it didn’t matter? Do your truly believe that Yeshua and Adonai are one? So I agree with Dr. Brown partially, but for different reasons: the power is in who and what the name represents. The power is in God and all that He is and all that He decrees. I will not come before Him as Cain and do it my own way – I will come before him in the manner He prescribes. God does not need to adapt to my will, understandings and needs – I need to adapt to His. Iēsous is a letter for letter mapping of Yeshua because the Greeks did NOT have a word for “Adonai saves.” They didn’t believe that He did. This would be considered a lexical gap in my opinion. The Greeks didn’t call Adonai I AM or Jealous or Y-H-V-H, they called him theos. To them, that is all He was, at best. So yes, Christians today can call upon the name of Jesus for their salvation. They can also teach the prosperity gospel. They can also start Jewish roots movement churches. They can preach and rationalize that worldliness and godliness can co-exist from their pulpits. They can talk about the worldly things they like and do. They can be strong on conversion and weak on discipleship. They can state that unless you speak in tongues that you are not saved. They can teach that all you need is mental assent that Yeshua is God for salvation and ignore the necessary repentance part. I am not God. He weighs their hearts. I am neither equipped nor authorized to judge their hearts. However, I suspect it is all of these things – starting with getting all things Jewish out of the church that has led to many of the horrors and atrocities performed in God’s name all over the world. How many really believe or know that Yeshua also died to break down the wall of enmity between Jew and Gentile? To make one new humanity? I won’t even go into spiritual Israel. So whether their understanding is weak, or disrespectful or irreverent or even blasphemous – in the end it will be their heart towards God that will be judged – not whether they called Him Jesus or Yeshua – but in whether they had a heart for God. Maybe, just maybe, that respect or awe starts with understandings: an understanding of the name and an understanding of the man behind the name. This entry was posted in Thoughts and tagged Adonai, christianity, Dr Michael Brown, even if, lexical gap, theos, Yeshua. Bookmark the permalink.